For the Medieval fair in Leksand I came up with a quick and totally inaccurate wulsthaube, and for Tuna Ting I wanted something a lot better. 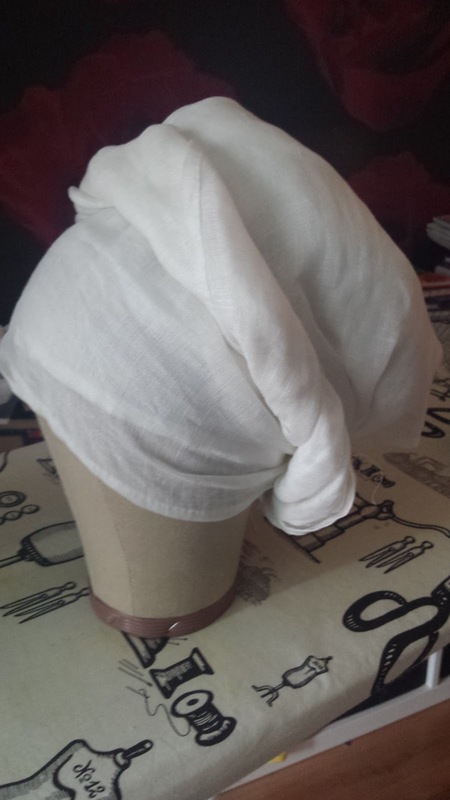 I ordered some fine linen and started working on it. My main source was the great tutorial by Katafalk on how she made her wulsthaube. There are some differences though. One is that instead of wool I used poly batting for the wulst itself. I also made my wulsthaube while it was on my headform, and when it was time for me to fit it to my head, with my hair, it was too small so I had to add an extra band to the haube. I was a bit worried that my wulsthaube wasn't as neat and even as Katafalk's, but after having looked around for photos of other people's wulsthauben I decided that it was god enough. 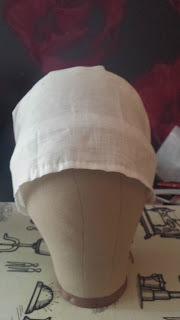 While working on it, and being frustrated that it didn't fit I also started thinking about if I should skip it and ask if I could just use my mother's headwear for her folk costume. 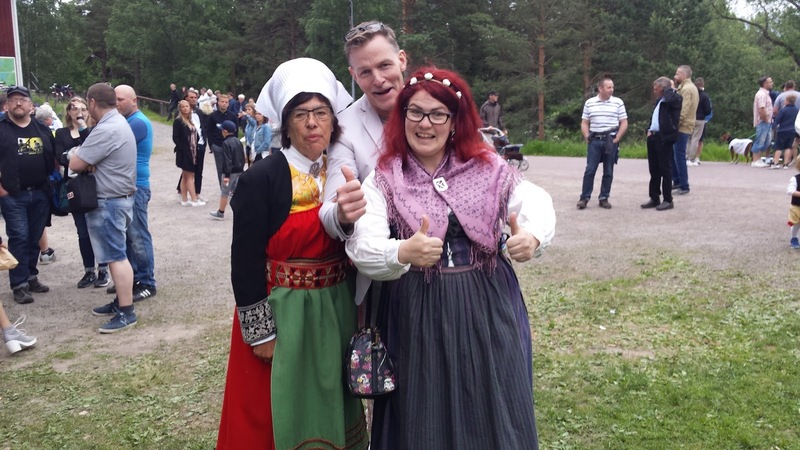 My mother, brother-in-law and me at Midsummer. My mother is wearing the costume from Vingåker, and I think it's pretty obvious that the headwear is a survivor from the 16th Century. The shape was formalized in 1674 when it was seen as old fashioned but it was decided that there were to be no changes to the costume. 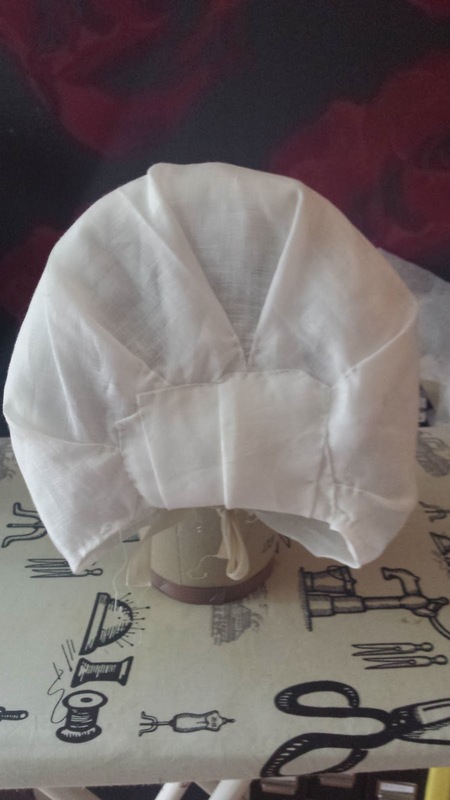 My mother's headwear is built up from wool covered straw and a lot more expensive than my linen. Still I ended up really satisfied with my wulsthaube. On top of the wulsthaube you add a veil. Katafalk calls this her "steuchlein" while Genoveva at http://germanrenaissance.net/ calls the whole headwear, including the wulsthaube and veil, a "steuchlein" and calls the veil a "schleier". I haven't taken the time to get fully ino the terminology but if you are searching the web for more information it can be a good thing to be aware of the different terms. 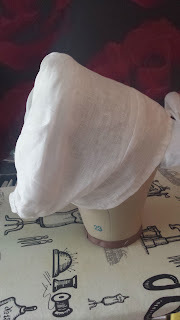 For my veil I didn't use the Katafalk "Steuchlein" pattern, but instead I started out with a piece of 100x150 cm of very fine linen. 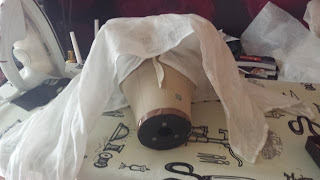 That was too bulky though when I tried to wrap it around the wulsthaube so I cut it in half and ended up with a veil that was 50x150 cm. As a bonus I now have two veils, if I just hem the other half of the fabric. In order to find out how to wear the veil I pretty much followed this video tutorial. I put the veil on assymetrically. 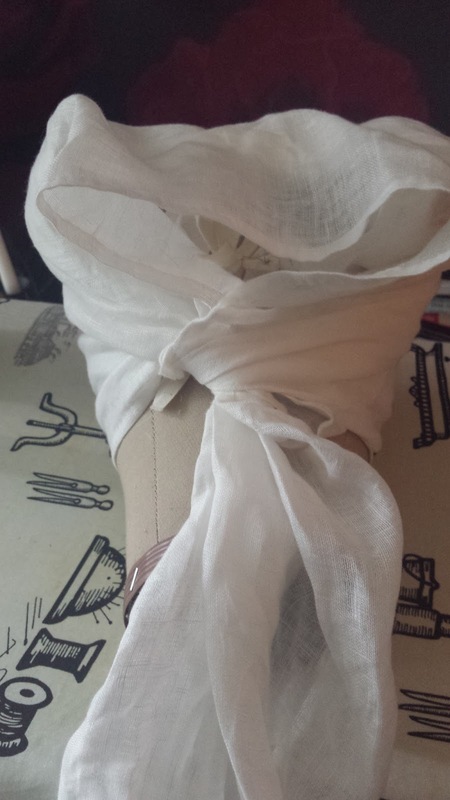 Then I twisted the rest of the veil and wrapped it round the head, and fastened it with a pin. 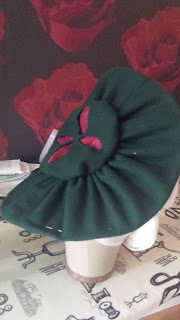 I also made a hat to wear on top of it all. I followed the tutorial from Handcrafted history, but I used millinery wire to form the shape, and it was too weak. It ended up smaller than I had hoped, and it was quite flimsy and the brim buckled. I also had some serious problems keeping it on my head. I'm thinking that I need to pin it to the wulsthaube and not just rely on the ribbons that I had fastened to it and tied around the wulsthaube. I wore the wulsthaube and veil the whole weekend and I loved it. I have grown up hearing how uncomfortable my mother's folk costume headwear is, and I was worried that this would be the same. I had also ended the Leksand medieval fair with a big headache.It was totally the opposite. Coming from 18th Century costumes it was so comfortable to just put the wulsthaube on and wrap the veil around it, I could even do it without a mirror. 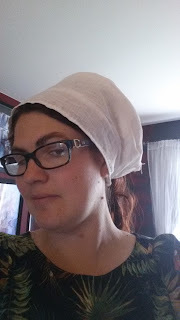 With my hair in braids and a wulstaube and veil made of fine linen my head stayed really cool. Saturday was a really hot day, but I had no hair in the neck, and in fact the only problem was that I ended up with a sunburn in my neck and top of the back. I need to make a shift with a higher collar until next summer. I'm now so inspired to really get into 16th Century sewing, but that will have to wait until next year. Now it's time for me to turn my attention to some cosplay projects for NärCon, end of July, and Stockholm Comic-Con in September.